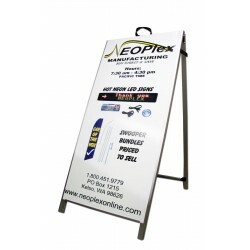 Our headquarters located in the Pacific Northwest, so we know about dealing with weather for your outdoor advertising. 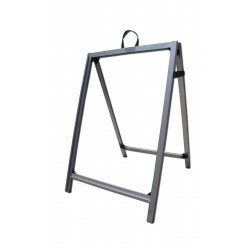 Our Anodized Aluminum A-frames are designed with inclement weather in mind and constructed on site. 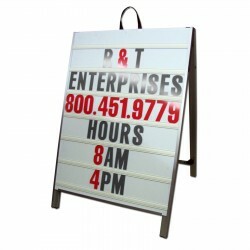 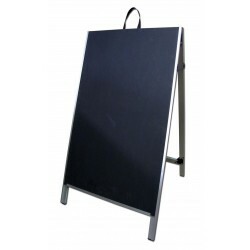 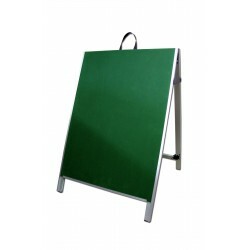 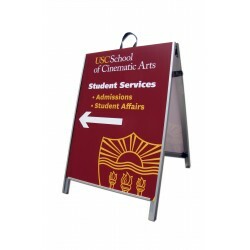 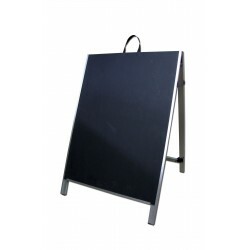 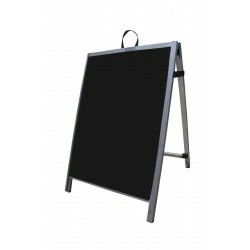 These Sidewalk Signs are both waterproof and weather resistant with sleek, lightweight design that makes them easy to move and store. 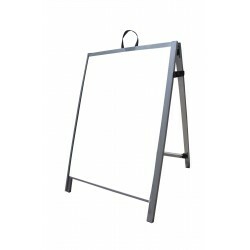 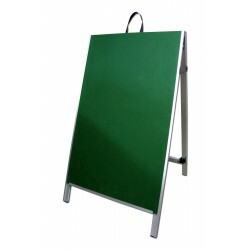 We carry them as a Frame-only or bundled with a variety of inserts and panels to meet nearly any advertising or display need. 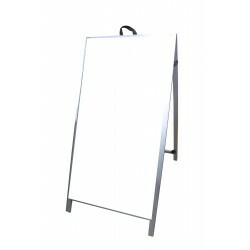 Don't see what you are needing? 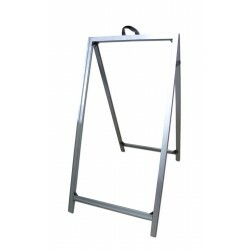 We are also able to produce custom A-frames. 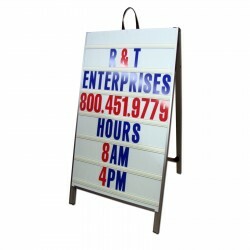 Contact us via phone or email and our customer service team can work with you. 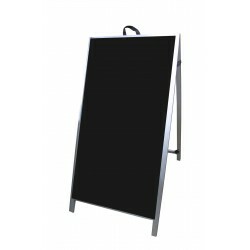 • Materials: Aluminum, Acrylic• Message Panel Color: Black• Finish: Anodized Aluminum• Dimensions: 3..
• Materials: Aluminum, Acrylic• Message Panel Color: White• Finish: Anodized Aluminum• Dimensions: 3..
• Materials: Aluminum, Chalkboard• Message Panel Color: Black• Finish: Anodized Aluminum• Dimensions..
• Materials: Aluminum, Chalkboard• Message Panel Color: Green• Finish: Anodized Aluminum• Dimensions..
• Materials: Aluminum, Corex• Message Panel Color: Black• Finish: Anodized Aluminum• Dimensions: 36 ..
• Materials: Aluminum, Corex• Message Panel Color: White• Finish: Anodized Aluminum• Dimensions: 36 ..
• Materials: Aluminum, Corex• Finish: Anodized Aluminum• Dimensions: 36 inches high x 25 inches wide..
• Materials: Aluminum, Dry Erase• Message Panel Color: White• Finish: Anodized Aluminum• Dimensions:..
• Materials: Aluminum, Dry Erase• Finish: Anodized Aluminum• Dimensions: 36 inches high x 25 inches ..
• Materials: Aluminum, Acrylic• Message Panel Color: Black• Finish: Anodized Aluminum• Dimensions:&n..
• Materials: Aluminum, Acrylic• Message Panel Color: White• Finish: Anodized Aluminum• Dimensions:&n..
• Materials: Aluminum, Corex• Message Panel Color: Black• Finish: Anodized Aluminum• Dimensions:&nbs..
• Materials: Aluminum, Corex• Message Panel Color: White• Finish: Anodized Aluminum• Dimensions:&nbs..
• Materials: Aluminum, Dry Erase• Finish: Anodized Aluminum• Dimensions: 48 inches high x 25 in..
Any outdoor A-Frame sign has one major enemy...The wind! 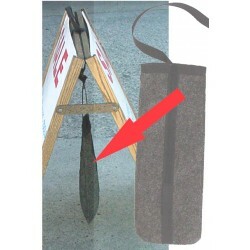 Our BALLAST BAG added to any of our A-Frame..